Contact us on 07896883553 to arrange a free FIXED price, no obligation quote. Alternatively, if you would like to enquire via our Facebook page Handyvan Removals or you can text me and I will call you back normally within 30 min. When you have received our quote and have decided that Handyvan Removals Ltd is the removals company you'd like to use then call me to confirm your booking. We are aware that there is a need for us to be flexible as sometimes details change at the last minute so don’t hesitate to call me and we can discuss the options available for you. As soon as you have a received a confirmed date let me know and I will ensure your slot in my diary is reserved and that nobody else can take that slot. Removal Day arrives, you can sit back relax and let Handyvan Removals Ltd do the rest. HandyVan Removals experienced staff will complete a site visit prior to your move to ascertain your full removal needs. Prior to your removal your belongings/items will be carefully and professionally packed using industry standard packaging materials as listed below. Boxes will be labeled, moved then sited in the correct room in your new home/office along with your large items of furniture. HandyVan Removals experienced staff will complete a site visit prior to your move if required to ascertain your full removal needs. Your belongings will be loaded, un-loaded and placed as per your instructions. 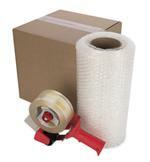 Packaging materials can be supplied prior to your move at a competitive price if required.